Chimpanzees preen in front of mirrors, elephants inspect themselves in reflective surfaces, and dolphins name themselves with individual whistles. Surprisingly, manta rays are in the same category as these charismatic mammals when it comes to intelligence tests. 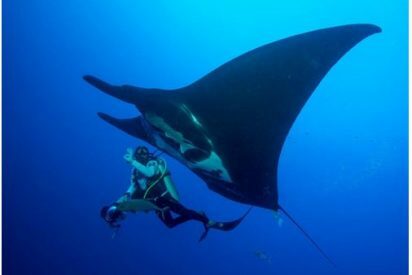 A recent study found that giant manta rays display the distinct behaviors humans assign to self-awareness. Manta rays are in the elasmobranch family of cartilaginous fishes that include sharks and skates. They have the largest known brain of any fish and coordinate hunting in large groups, suggesting social intelligence. Because of this, a research team decided to try to assess their mental capacity to determine if they are self-aware. It is difficult to measure mental states or feelings in an animal, so behavioral responses are used instead to deduce consciousness. A mirror test has been developed to see if certain animals have a sense of self and some understanding of their place in the world. Mirror self-recognition tests (MSR) are used to look for exploratory, contingency checking, and self-directed behavior in animals when they see their reflection. Cats and dogs, though intelligent, do not recognize their reflection as their own image, and behave socially as if they are meeting another of their kind. 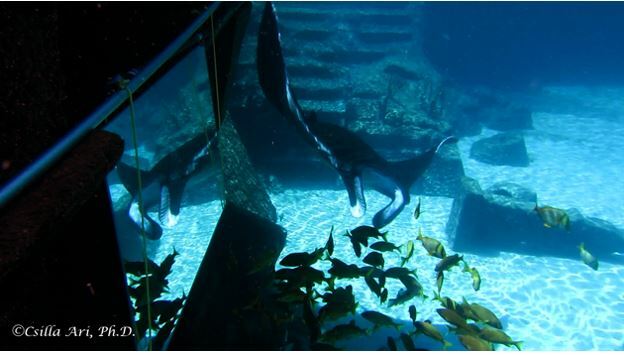 The male giant manta ray checks himself out in the mirror placed in his exhibit. On the other hand, primates, cetaceans, and elephants all display unique self-directed behaviors in mirrors, and also share common characteristics such as large, complex brains, intricate social groups, and empathetic behavior. Manta rays also possess elaborate brains and high social intelligence, which is why they are possible candidates for self-recognition. Looking in a mirror requires visual cues, however, and the MSR test has been criticized for not being very applicable to fish because they rely more on chemo-sensory cues. It was deemed appropriate in this case because manta rays have exceptional vision compared to other fish. 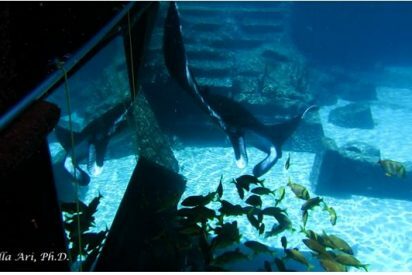 In the study, two captive manta rays were tested for self awareness by placing a mirror in their tank and observing their behavior over extended periods of time. Not only did the rays spend significantly more time in front of the mirror than other portions of the tank, they behaved oddly when in front of it. They performed unusual and repetitive movements (a behavior known as “contingency checking” where they examine themselves), such as blowing bubbles at the mirror, and flipping to expose their underside. They did not display social behavior, something non-self-aware animals do when they see a mirror because they assume it’s another of their species. In fact, giant manta rays have a specific behavior for meeting new individuals – their white spots expand and contract, neither of which happened when they glimpsed themselves in the mirror. The social behavior between the two rays drastically decreased when the mirror was present, something that also happens with dolphins and apes. They become too busy checking themselves out to notice one another! All other animals who have passed the MSR test are protected (at least in the US) – dolphins under the Marine Mammal Protection Act, and gorillas, chimpanzees, orangutans, and elephants under the IUCN Red List of Endangered Species. Manta rays are listed as vulnerable in the IUCN Red List of Threatened Species, and their hunting is monitored, but there is a large demand for them in Asian markets – which raises questions about the legality of hunting them. In the US, our legal system maintains that consciousness matters. When we determine that another animal species has consciousness similar to us as humans, we view it as negligent not to extend rights and protections to that species. However, other countries have different cultural norms and laws, so the policies around hunting manta rays may vary. The waters around this issue are murky. Octopuses are argued to have consciousness, and they are harvested around the world, with no humane standards for killing them. In countries such as South Korea they are eaten alive. Similarly, manta rays are often harpooned and cut into pieces while alive because their bodies are too big to fit on boats otherwise. Their gills contain an ingredient needed in many Chinese medicines, and they are being hunted more as stricter measures are taken against shark-finning. If manta rays are self-aware, what about other fish and shark species? Have we been underestimating them all along? For years humans vainly believed we were the only ones with higher-order intelligence. Maybe it is time to take a step back and give our wild counterparts more credit.